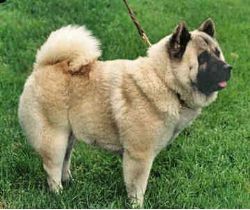 This all-rounder breed was first discovered in China and was used for herding, sledding, hunting, and guarding purposes. They are believed to be a breed evolved from crossings of Northern European hunting dogs and Chow Chow. Chinese Foo Dogs are used as watch dogs for the Buddhist temples because they are thought holy to the Buddhist religion. Other than this, the Chinese Foo is also a mascot of the Tongs who believe it to bring good luck. As a result of this they have bred these dogs and kept them as a mascot of their organization. This breed has no known health diseases and may live for 12 years.